First, I wanted to thank everyone who voted for Cleveland Area History in Scene magazine's Best of Cleveland contest. 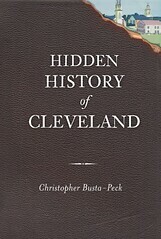 Thanks to your support, Cleveland Area History was named Best Blog. At the risk of sounding self-indulgent, I'll bring up the following item. On Sunday, I was profiled by Grant Segal for his series, My Cleveland, in the Plain Dealer. The following are links to the subjects that I've written about previously, in the approximate order that they were mentioned in the profile. This picture is of the Jesse Owens House, at 2178 East 100th Street, where Owens lived at the peak of his career, from 1934-1936. 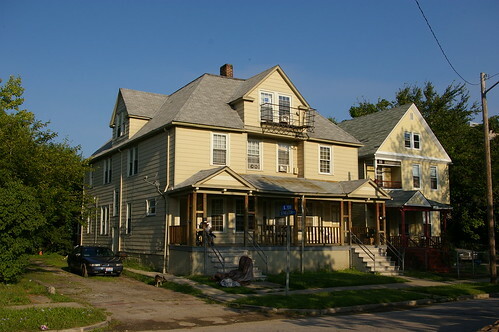 The Langston Hughes House, at 2266 East 86th Street, Cleveland, Ohio, is now a Cleveland Landmark. The stone building at 16360 Euclid Avenue is known as the Luster Tannery. I wrote a review on the book, The Day-Glo Brothers and also looked into the location of the house where they invented Day-Glo paints. Again, thank you for your support over the past year and a half. The stories mentioned above are but a small sample of what has been covered here. If you're new here, be sure to browse some of the older entries. Congratulations, Christopher. The Scene award and the PD profile bring out CAH’s two primary themes. First, our legacy structures are assets for maintaining an important city. All cities sustain cycles. The residents of great cities know and use legacies to continue, with dignity, through cycles. CAH brings out legacy structures/architecture as resources for rebuilding in a new era. Second, CAH also tells the story behind or within the building. For legacy to develop, each place must have its story. Thank you for your work.